Ian Taylor kicks off his own range of Bluetooth headphones | What Hi-Fi? 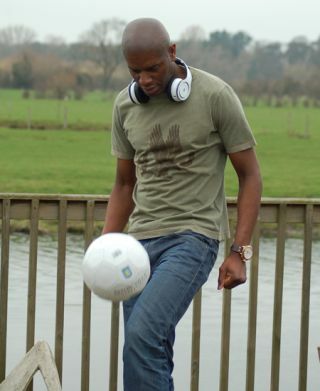 Former English Premier League footballer Ian Taylor is the latest celebrity to release his own range of headphones. Taylor, who played for Aston Villa, Derby County and Sheffield Wednesday, has teamed up with technology firm Bluechipworld to create the iT7 range of Bluetooth sports headphones and music systems. "During my football career I was constantly pushing myself and aspiring to be the best. This philosophy remains and I am putting the same level of dedication into the range as I did on the field, and am therefore placing huge importance on ensuring the products are the best they can be," says Taylor. All products in the IT7 range include stereo Bluetooth wireless technology from CSR. The full line-up consists of: iT7X headphones (below, £150); the smaller iT7 headphones (above); iT7 Sport in-ear headphones (£100); and the iT7m Bluetooth speaker system which can also be used as an in-car hands-free kit.